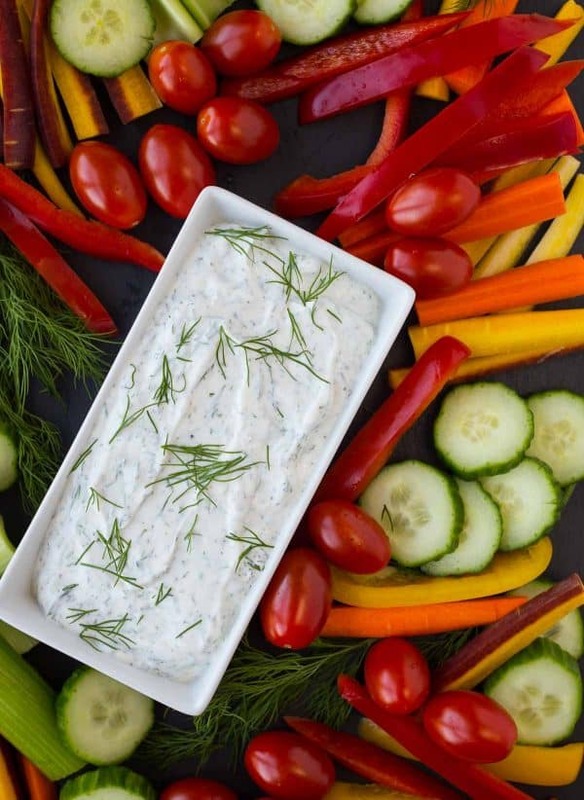 This skinny dill vegetable dip is a staple in our fridge — we’re hardly ever without it! 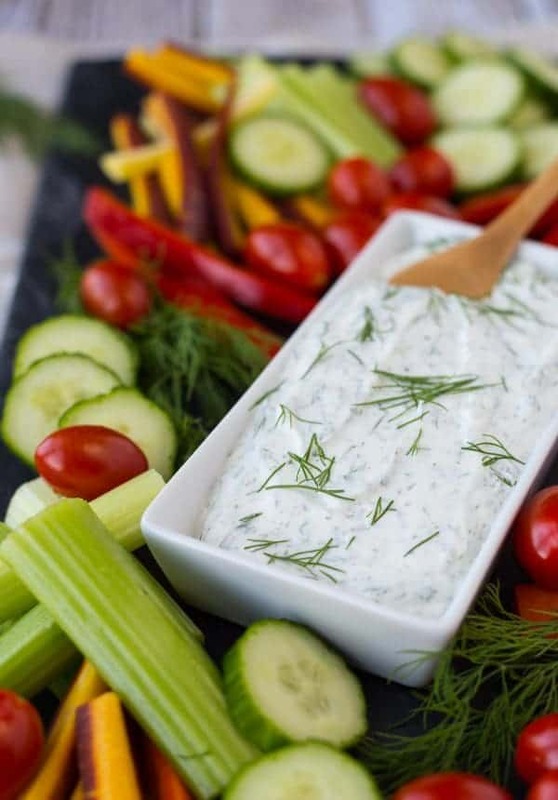 You won’t want to stop snacking on vegetables when you’re dipping them in this healthy and low-cal dip. I developed and photographed this recipe in October and I have been so eager to share it with you all. I was going to share it on Wednesday, but my little man has been in and out of the ER so things have been a little nutso. PS: He’s 4-years-old now! That means it’s been four years since I wrote this tongue-in-cheek post and got a wave of hate-mail and people telling me I was a terrible person, ha. He started limping on Saturday (NYE) and had no injury and didn’t seem to be a large amount of pain. When he woke up still limping on New Year’s Day (Sunday, also my husband’s birthday), we took him in to the emergency room — super fun way to spend Ben’s birthday! They checked him over really well (not doing any blood work at this point) and decided that he probably had something called Toxic Synovitis which sounds way scarier than it actually is. We were instructed to come back in two days if the limping hadn’t gone away with the administration of ibuprofen. So…back to the ER on Tuesday! This time, in went the IV for blood work, and we also had an x-ray and an ultrasound done. Thankfully, all tests came back negative. Unfortunately, it meant we had no real answer, but we had ruled out all the big bad things so I am extremely grateful for that. As I type this on Thursday, he still has a slight limp, especially as his ibuprofen wears off. I’m hopeful that he’s improving and that we won’t have to head back in again this weekend. The kid hasn’t stopped being his cheerful, smiling self once though, even while he got his IV. The next day he started limping. So now our count is up to 6. SIX. And he’s four. Too many, if you ask me. Then there’s my 6-year-old who has never been to the ER. Don’t worry, I’m sitting at wood table and you better believe I knocked on it. I’m beyond thankful that there isn’t anything serious wrong with him (that we’re aware of) and that we have an amazing children’s hospital at our disposal. I can’t say enough good things about Helen Devos Children’s hospital — they took such great care of my little guy. 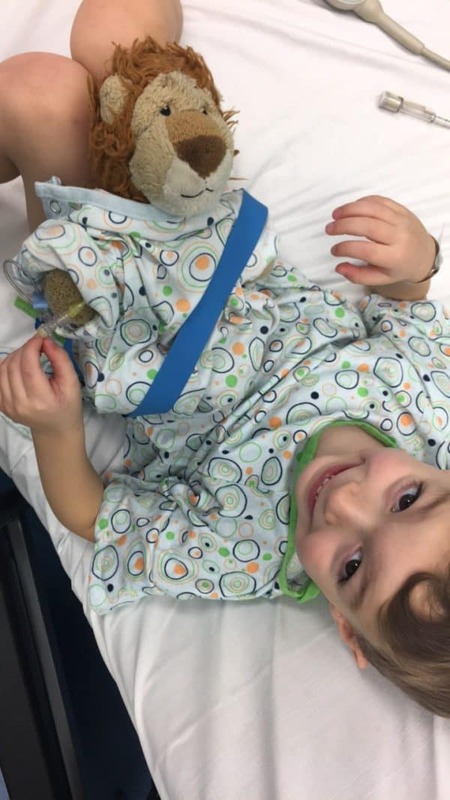 His lion even got a gown and a wrist band, and Nathan got to practice with the IV on his lion before he got his own. 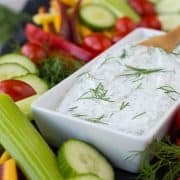 Back to the dill vegetable dip, since the first time I made it, I’ve made it no less than 10 times. Ben and I cannot get enough of this dip, and I’ve made it for almost every holiday celebration we’ve been to as well. 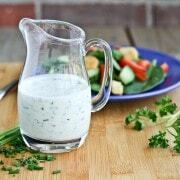 It tastes like the dill dip you buy at the store, but it’s made healthier using Greek yogurt. This dip gets me to eat way more vegetables than I normally would. You can make it with fresh dill if you have it, but I’ve also made it many times with dried dill and it tastes great that way too. It comes together in 5 minutes and you probably already have all the ingredients you need! Transfer to a serving bowl and store covered in refrigerator. Serve cold with fresh vegetables. Note: I’ve made this countless times with dried dill (dill weed) instead of fresh. I’d recommend 1 tablespoon of dried dill, increase to taste as desired. Note: Use your “Use by” date on your yogurt container as a guide for how long to store this in the fridge if you use dried dill. As long as you don’t double dip! If you use fresh dill, I’d recommend using within 5 days. Note: Dip may separate slightly in the fridge with a watery layer forming on top. Simply stir to combine before enjoying. 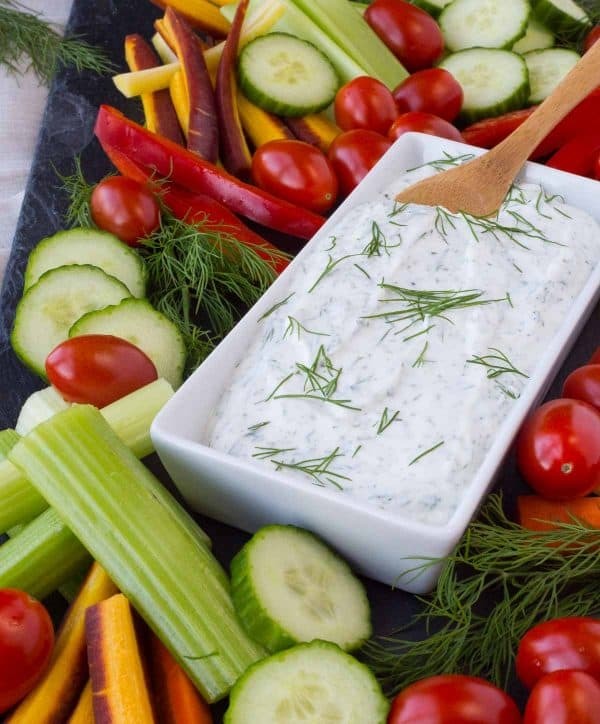 Verdict: I’m obsessed with this dill vegetable dip. Our fridge will never be without it. 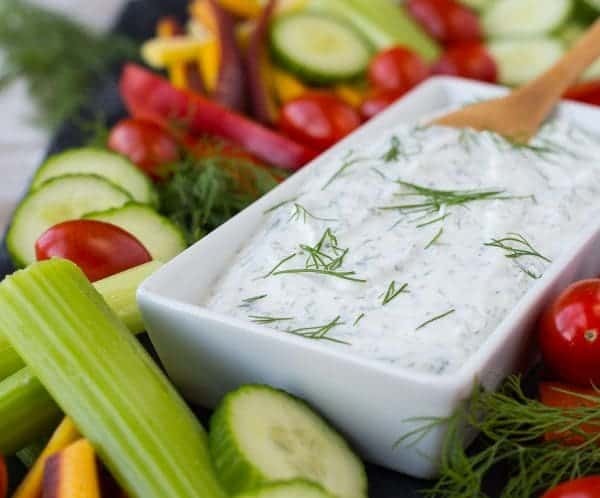 Husband’s take: Ben is not a fan of ranch or creamy dips UNLESS they are made with Greek yogurt (I love that he likes to make healthy choices! ), but he adores this dip. He’d probably be annoyed that I used the word adores (he’d say it’s not “manly”), but he doesn’t read this. 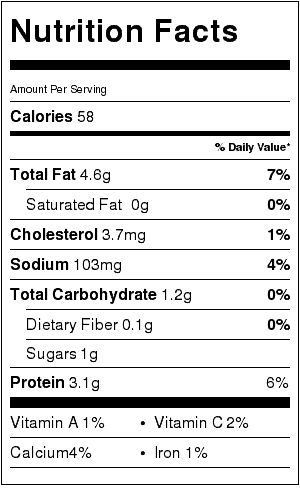 PS: 58 calories per serving!!!! WOOHOO. 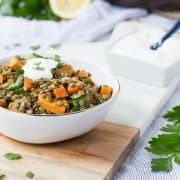 I’m trying to adopt a healthier eating pattern and was looking for something that would help me eat my veggies more often. This is great. Took me not even ten minutes to make and I dipped a couple carrots in it and it’s great. This is really going to do wonders for me and the fact it’s keto friendly and low cal is even better too. Thank you. Hi Kay! I’m so glad you liked this recipe – it’s one of my favorites, too. Thanks for taking the time to come back and leave a comment! I made this recipe tonight. It’s delicious! I will definitely make this again and again. Thank you. I’m so happy to hear that, it’s one of our favorites too! I’m always afraid to try new dips, but I just made this one, and it’s really good. I am a ranch dip/or dressing person, but I’m glad I tried this recipe. Pretty sure it will be great for football tomorrow, as we are always looking for a little more healthier food to eat. Thanks for sharing! Oh I’m so happy to hear that, Peggy! Thanks for taking the time to come back and leave a comment, it means so much to me! Just made this without the garlic and onion powders (pretty sure I’m intolerant or allergic to garlic!! ) but it was still SO good. Equally as delish when you dip crackers and cheese, too!! So glad you liked it! I’m going to try it with crackers and cheese – yum! Thank you for your simple, delicious recipies. Hi Rachel, I’m very sorry to hear about your Lil boy. I love this recipe. My husband was just recently diagnosed with diabetes type 2. We have been through a lot in the past 3 years……I rescued my mom via Adult Protective Services. I live in WI, but, grew up in California, where my mom still lived in the same house my dad bought for her in 1963. She raised all 4 of her children there. So after my dad died, she sounds up with a man you used and aabused her. So I get a call from APS to come pick her up. Finally!! I tell myself I get to rescue my mommy. Then we settle into her new life living in WI. ( That abusive man is still living in my mom’s house) but at least I rescued my mom! So then my husband ruptures and extrudes a disc in his lower back and is rushed into emergency surgery. So he recovers. Now back to my mom, she has tongue cancer. We knew this when I rescued her in CA with the adult protective services agent and two sheriff’s because he was unwilling to lose his “free laborer and cook). So now back to WI. We meet with an ENT surgeon and he recommends, after biopsy results, a reconstructive surgery of her tongue. So they remove her cancer, take a piece of her thigh and make her a new toungecflap. So now Praise the Lord, she is cancer free!! I am a RN, so I take care of my mom at home. Once she was healed and recovered I went back to work. So we are living our life and enjoying camping and boating. One camping trip we took out boat out onto a lake where we have made many trips. We also loved taking cruises on the Mighty Mississippi River. So back to the lake, we get up in the morning, get on our 27 foot cabin cruiser boat, we back out into the no wake zone, then it dies. We start it again and head for the lake. We get the nose up in the air….then all of a sudden….BAM! It explodes. My lil girl was air lifted to the UW Madison WI burn unit. I was taken by ambulance to a local hospital, the assessed my burns and transferred me to Madison burn unit also. There my daughter and i spent half of our summer. The pain was unbearable. My lil fire is completely grafted from her toes to her thighs with all of the skin the surgeon harvested from her back. She had 35 percent of her body 3rd degree burned at the young age of 9. I was 27 percent third degree burned and was grafted also. So we spent half of our summer in the Intensive Care Burn Unit. So we were released to recover at home candidate go through weeks of painful physical therapy. Now I am working FT again, my daughter is in Volleyball. The Lord our Saviour Jesus Christ let us live for a reason. We could of died but, we didn’t. So I want to thank you for making my life easier with all your wonderful recipies. Are you the Rachael Ray? I pray that the Lord will keep your family safe and healthy. I will definitely be making this over the weekend. sounds delicious. This was so delicious! And simple too! My first time to your site but I’ll definitely be back now! Thanks for sharing!! Oh I’m so glad you liked the dip, Hayley! Thanks for taking the time to leave a comment and for sticking around to find more recipes! Means so much to me! Great recipe! I used full fat Greek yogurt and a dash of olive oil. Omitted the mayonnaise. Fantastic! So happy to finally have a clean version of my favorite dip. Thanks! I’m so happy to hear you like this one! Thanks for sharing your adaptations and for taking the time to come back and leave a comment! Sorry I didn’t rate it the first time. Just made this for thanksgiving tomorrow and I tried a little tonight. It was really good. I did all Greek yogurt added a dash of lemon juice and milk to thin it a little. Was very tasty and I’m excited to see how it tastes tomorrow when it sits a little longer. 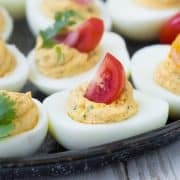 Thanks for a yummy and easy dip recipe! So happy to hear that! It’s going to taste even better tomorrow! Thanks for taking time out of what I’m sure is a busy night to leave a comment! It means a lot to me! Hope he’s doing better and am glad that’s all he had. I looked at your link of the description. My brother had Perthes, aka :Legg-Calve-Perthes disease is an insufficient blood flow to the hip joint, leading to the collapse of the joint as the bone dies. this dip looks really good – I’ll definitely have to make it. I’m trying to look for healthier recipes right now, so this was sent at the perfect time. Sorry to hear about your little guy :(. I hope they figure everything out and he’s better soon!